The small 911 memorial in Kansas City was a somber place last night. A water wall gives space for reflection and prayer. 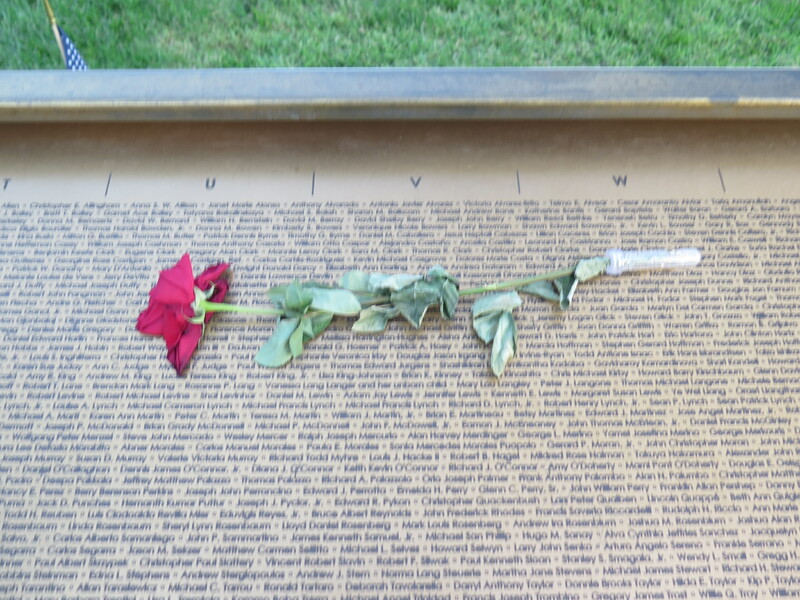 Flowers from the remembrance of the day before rested against the jagged beam flamed in the fires of the Twin Towers. One for the “crew ” of a plane lost – another named a Sargent. A single rose was strategically placed over names near the end of the alphabet. 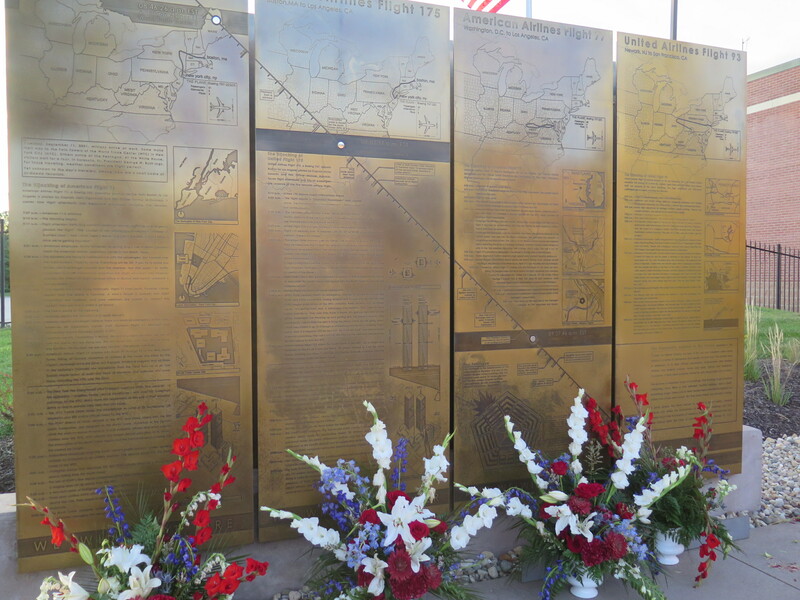 Four bronze panels describe each of the flights, naming the conditions on the planes as described in phone calls. A flight attendant dead, box cutters, warnings of a bomb on board. Promises they would be alright if they didn’t resist. Fear and terror. A call to a father watching TV as his son’s plane hit the First trade tower. Last words from a son mixed with the screams and cries of other passengers. The last panel describes the other plane. The one that didn’t hit the twin towers or the Pentagon. It too had its stories. Still in the air after the other planes crashed, each phone call added to the knowledge that there would be no easy landing. They were more than hostages. Their plane would crash into another building. Tom Burnett was dear to the hearts of my Bloomington MN congregation. High school football player, a classmate – a neighbor’s son. Today, my grandsons attend the same elementary school that he did. He was among the four passengers, along with Mark Bingham, Todd Beamer and Jeremy Glick who decided to take back the plane, storming the cockpit. The voice recorder catching his voice yelling, “roll it.” Instead of the White House or the Pentagon, this plane would crash into a field – the plot foiled, but not without great cost. Sitting by the reflecting wall, I thought about all the lives changed since that day. Parents who lost children, children their parent, siblings and spouses – friends gone. I thought of the wars fought and other lives lost . . . those who fought for us and the innocents caught in every war. So many lives forever impacted by that day. In the fading light I was reminded of the fragility of life and how very important it is, that we spend each day, loving the people around us, seeking justice, loving mercy and walking humbly with our Lord. Today I think how important it is to combat falsehood in whatever form it comes – from the brainwashed young minds of the 911 hijackers to the rise of white nationalism. It is the task for every generation, to speak the truth, to teach integrity, to rise up against evil and to plant seeds of goodness, mercy and love.